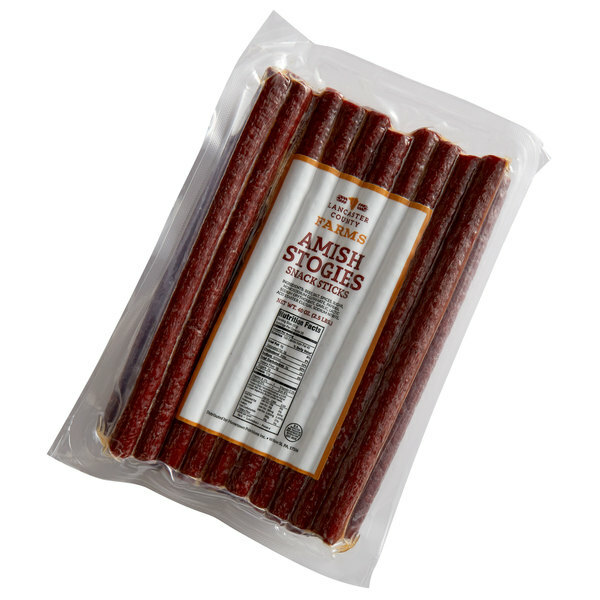 For a bold savory flavor, turn to these Lancaster County Farms Amish stogies meat snack sticks! These snack sticks are made with lean cuts of 100% beef that are seasoned and smoked for an unmistakable taste. They offer an enjoyable moist interior within the dried casing for a distinct texture your customers will know and love. The high-quality beef makes these snack sticks the perfect complement to cheese and cracker boards. You can chop up the sticks into bite-sized pieces for a tasting platter, or leave the sticks whole and pair them with cheddar or Swiss cheese, pretzels, and mustard for a hearty snack or appetizer. These snack sticks combine the flavor your customers crave, with the convenience they need. They're a protein-packed snack, great for taking on-the-go. Plus, they are packaged in a vacuum-sealed bag to ensure optimum freshness. Offer your customers a tasty treat with these snack sticks. Based in the rolling farmland of south central Pennsylvania, Lancaster County Farms prides itself in creating the finest beef jerky and cheese products. Using fine, high-quality cuts of meat and premium cheeses, Lancaster County Farms delivers a high-quality products that are packed with flavor your customers are sure to love. Offering a wide selection of products, Lancaster County Farms ensures small-town excellence with time-honored tradition. Serve up the best with Lancaster County Farms!